A counter can be used to count a number of actions or events. It thus participates in production management and preventive maintenance. A ratemeter can be used to display the speed of rotation of a motor in real time. 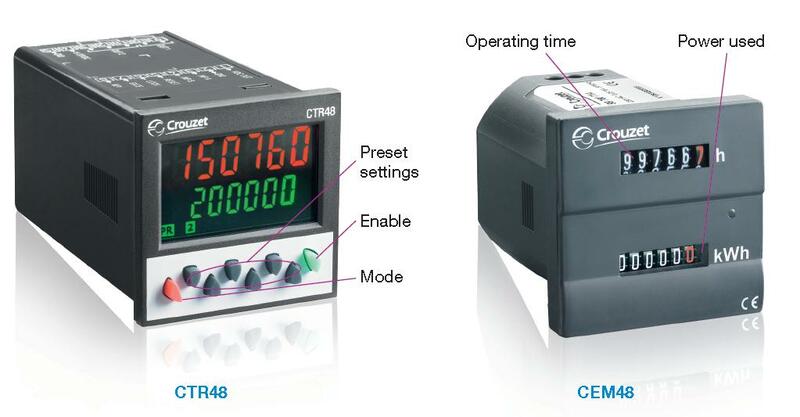 For up counting or down counting a number of parts, events, a running time, the counter is the ideal solution. There are different types of counter with the following functions: up/down counter, batch counter, ratemeter, chronometer, multi-totalizer, elapsed time counter, impulse counter. A counter can allow a user to be informed and to display data and quantities easily. The data displayed can be read directly on the front panel. A counter can be used to trigger an action or an intervention on a machine. The outputs actuate directly and/or transmit data to the control system. A counter can be used to schedule preventive maintenance. The machine running time is measured and the duration of an action timed with a chronometer. For fast count applications, a high-speed counting frequency: up to 50 kHz. A two-color or backlit LCD dual display for ease of reading. Considerable space saving due to dual-function electromechanical and electronic ranges. 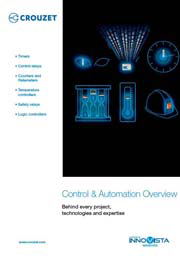 A complete output operating logic to cover complex applications. Easier maintenance thanks to removable connectors (CTR48). An enhanced multifunction electronic range for optimized stocks.